I'm changing servers...my site might be a little wonky for a few days. 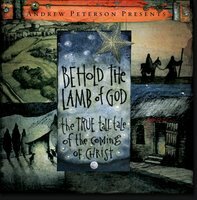 Saturday night, a buddy and I headed to Northern Chicago to see Andrew Peterson and friend's Behold the Lamb of God Concert. It was a amazing. Andrew has some talented friends who "accompanied" him for the concert - Derek Webb, Andy Gullahorn, Jill Phillips, Sandra McCracken, and Eric Peters. They're all a part of a consortium/collaboration/whatever of artists called Square Peg Alliance. The first half of the concert was a round robin of the group of talented friends taking turns singing a song from their individual albums accompanying eachother and telling funny stories between songs. It was the first time I'd really heard Eric Peters and I really liked his stuff. I was already a fan of the rest so it was nice to find another artist to listen to and I picked up one of his CD's at the intermission. 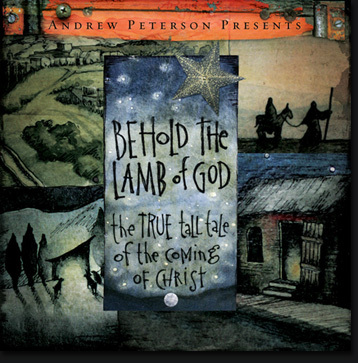 After the break, they went straight into the Behold the Lamb of God set without any talk between songs- just one majestic anthem after another. They had some very talented other artists supporting them and, of course, one of my favorite instruments - hammer dulcimer baby! If you can catch him another time, I highly recommend it. About a month ago I was talking to a friend about the moon and had a poetic moment... She walks across the azure field; Behind a vaporous veil she moves- Cycled grace tinting her shroud with light; Peering though a vapored veil, She breaks forth in glorious display- Pearl of the night, Watcher of day; She considers, she reflects Light not her own, She shines with glory rebounding- The light of fiery King of watchful space, Whose vivid rays trace earth’s rim to find her face and in love, un-dim.